Which Spurs team will turn up at Wembley? I have a question that nobody out there in Spurs Odyssey land can answer: “Which Tottenham team will turn up at Wembley for the League Cup final next Sunday?” Will it be the side that so emphatically conquered Chelsea and Arsenal in recent Premier League matches at the Lane, or the tame team that was lucky to salvage a dramatic point against West Ham yesterday? Let’s be honest, none of us has a clue what sort of performance to expect at Wembley. It could be an afternoon of joy or, just as easily, humiliation. I just hope Chelsea’s followers allow all our fans on to the trains to get behind the team. One thing I do know is that Mauricio Pochettino must select our best side for the final, and give much less concentration to Thursday’s Italian job in Florence. The vital thing is getting some silverware in the Tottenham trophy cabinet, which has been as little used in the last seven years as Daniel Levy’s comb. No question in my mind that the cup final MUST take priority in Pochettino’s planning. We cannot risk injury to key players against Fiorentina. I am thinking of the likes of Hugo Lloris, Christian Eriksen, Jan Vertonghen and, of course, Harry Kane, who gave Chelsea’s defenders such a drubbing in the January League match. We need them to be fit and fresh for the Capital One Cup challenge. Yes, of course we want to progress in the Europa League, but not at the sacrifice of producing our best in the showcase final on Sunday. Lloris or Vorm as the last line of defence? I would definitely go for the Boss, but I have a hunch (it’s the way I walk) that head honcho Mauricio will plump for the Flying Dutchman ahead of the Flying Frenchman. Yesterday’s heart-stopping duel with the Hammers did little to boost confidence in the build-up to Wembley. Big Sam Allardyce won the tactical battle with Pochettino, strangling Tottenham in defence and bossing the midfield, where West Ham skipper Mark Noble was a dominating orchestrator. It was not until Allardyce withdrew Noble to protect him from a second yellow card that Tottenham began to control the engine room, and Spurs then showed the character we now take for granted as they battled back from 0-2 to get a draw that burst the Hammers bubbles. Harry Kane’s equaliser – after a one-two with goalkeeper Adrian from the penalty spot – was officially clocked at 95.54 minutes, and it sent Big Sam into orbit with anger. The timing of fourth official Mike Dean took the focus rather than a Tottenham recovery that rescued a point they did not deserve. They snatched a draw from the jaws of defeat, but you have to be very one-eyed to think that West Ham were not worthy of all three points. West Ham fans insist there was a touch of Tom Daley about Our Harry’s tumble that earned the penalty, and I hope for his dignity’s sake that this sort of splashdown does not become a habit. Big Sam hinted that he deserved the Best Actor Oscar. From my high horse I say this is not the traditional way for Tottenham to play the game. The teams I have grown up and got old with have always played to win but fairly. I don’t think Harry took a dive, but we have seen him go over easily in a few recent games. He does not need to do that. Our Harry should just carry on playing the Tottenham Way. Here’s hoping we come away from Wembley with heads held high and with a trophy to show off. It would be nice to wipe the smug smile off the face of Jose Mourinho by repeating the 2008 League Cup final win over Chelski … regardless of how long the game lasts. That would have Daniel Levy combing for compliments. Those of us lucky enough to join in the 75th birthday bash for goal king Jimmy Greaves in Stevenage on Friday found ourselves in a Tottenham paradise. There were wall-to-wall Spurs legends to help make it a fitting night of nostalgia for the greatest forward ever to wear the Lilywhite shirt. 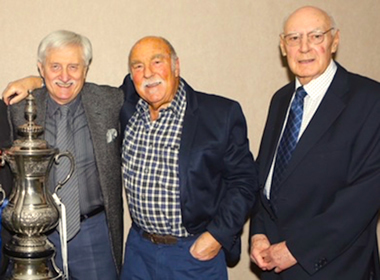 Jimmy’s all-time favourite playing partner Alan Gilzean was among the guests, and the photograph here features The G-Men … and another Gilly, little old me. Greavsie and Giller have worked in harness on 20 books since the 1970s, but it was the goal-gorged six-year partnership with ball-playing artist Gilzean that gave him most pleasure. “The greatest footballer I ever played with,” was the huge compliment from Jimmy. For those of you not lucky enough to have seen Gilly let me tell you he was like a Nureyev on grass, all silky skill and with deceptive changes of pace and total control of the ball. The nearest I have seen to him in the modern game is Dimitar Berbatov, but he could not match the slimline Scotsman for glided, guided headers. No wonder he’s got little hair now as he approaches 77. Among other former Tottenham players bowing the knee to Greavsie were Steve Perryman (looking great after what he admits was his recent brush with death), Gentleman Ossie Ardiles, Paul ‘Max’ Miller, John Pratt, Phil Beal and, the man who is a bruise on Jimmy’s memory, old Chelsea warhorse Ron ‘Chopper’ Harris. The highlight of the evening was an in-depth question and answer session that followed a hilarious stand-up comedy routine by Jimmy in which he showed timing and delivery better than most professional comedians. He paid tribute to organisers Terry and Freda Baker, the dynamic duo who run the premier A1 Sporting Memorabilia agency (http://jimmygreaves.net/jimmy-live/) that handles promotional events for many major stars from yesterday’s football world. I have known Terry for years and am always happy to recommend his services, because I can vouch that all his memorabilia is genuine, and that the ex-players get their proper payment in a world where there are a lot of frauds at work. Be careful. You will know that through my Spurs-themed books I do as much as I can to raise money for the Tottenham Tribute Trust, the wonderful organisation that helps our old heroes who have hit difficult times. With the League Cup final as the driving force, they have teamed up with an excellent group of musicians calling themselves Ledley and the Kings. They have got permission from Chas ‘n’ Dave to record an updated version of the 1987 FA Cup final hit Hot Shot Tottenham. The toe-tapping 2015 adaption costs just 59p to download and all profits go to the Trust. For the price of a cup of coffee you can help those great players from the glory-glory years that missed the gravy train. You can get full details here http://www.tottenhamhotspur.com/news/hot-shot-tottenham-15-200215/ Please show true Spurs soul and spirit and buy a copy to help a great cause. Thank you. We are now into our EIGHTH week of the League, and the logjam at the top of the table continues. More than 100 of you share first place! But as I keep reminding you, I have a super tie-breaker for later in the season that will sort the men from the boys. Meantime, please keep playing along. It’s all about having fun while testing your Tottenham knowledge. Most of you were again correct with the answers to last week’s questions: Who scored a hat-trick for Tottenham against the Hammers at White Hart Lane on February 2 1987? And for a bonus point, who was in goal for Spurs in that match and kept a clean sheet? Yes, of course, it was Clive Allen, who scored a hat-trick in the last ten minutes of a League Cup quarter-final in his ‘Golden Boots’ season, with goalkeeper Ray Clemence keeping a blank sheet. First name drawn from the senders of the correct answers is John de Krom from Geleen in the Netherlands. He has supported Spurs since seeing them win the European Cup Winners’ Cup on that historic night in Rotterdam in 1963. I will be emailing him a screen version of my Bill Nicholson Revisited book. This week’s challenge is triggered by next Sunday’s League Cup final against Chelsea at Wembley: For three points, who was manager when Spurs last won the League Cup? And for a one point bonus, who scored for Tottenham from the penalty spot in the final? Email your answers please to SOQL8@normangillerbooks.com Add your name, the district where you live and how long you’ve supported Spurs. I will do my best to respond.